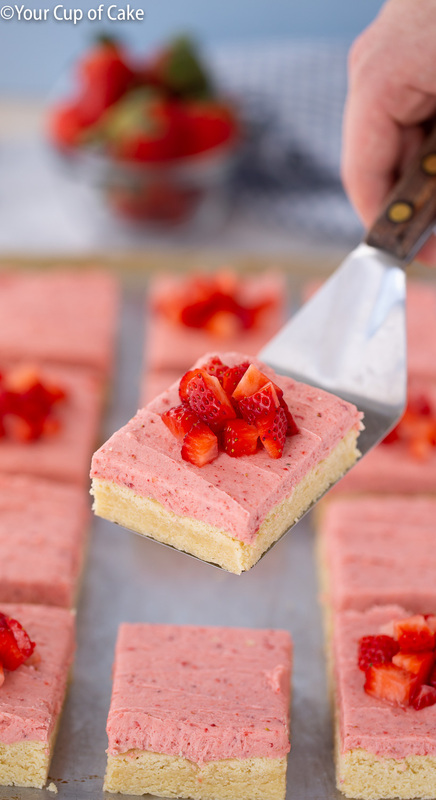 If you like sugar cookies you’re going to love these Strawberry Sugar Cookie Bars topped with all natural strawberry frosting! 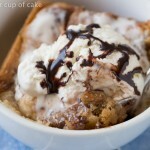 The perfect spring dessert for a crowd! 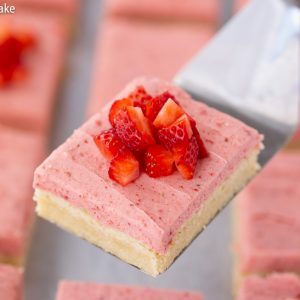 I made some incredible sugar cookie bars a few months ago for Valentine’s and as I was eating them I kept wondering what they would be like with a strawberry frosting! 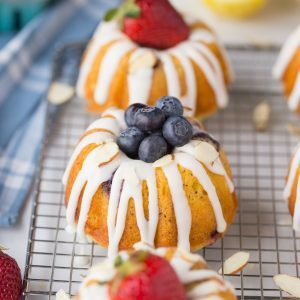 I’m all about spring recipes, even when it’s the middle of winter I can’t help but dream of lemon cake, key lime pie and every dessert topped with a million berries! 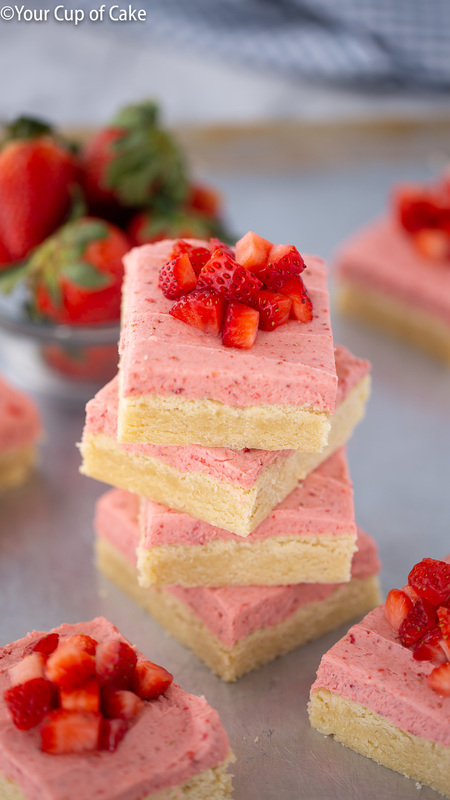 So of course I had to whip up these Strawberry Sugar Cookie Bars, and wow! Such a great flavor combination with the subtle almond in the cookie and the strawberry of the frosting. 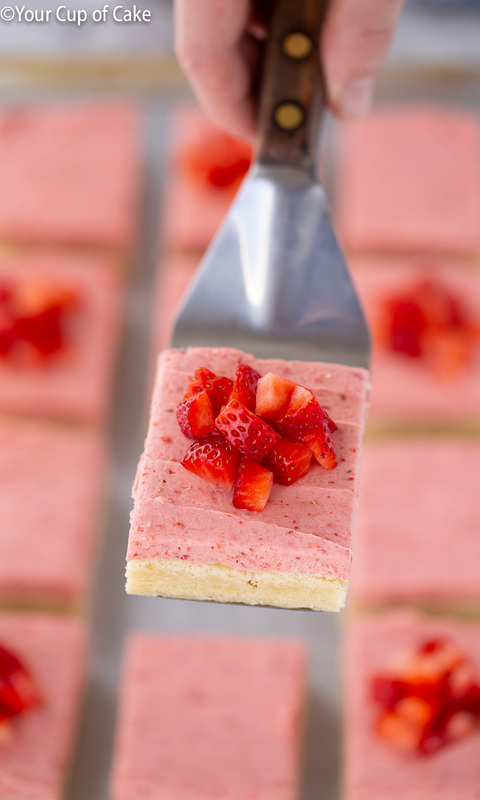 These Strawberry Sugar Cookie Bars are perfect for bridal showers, baby showers, spring or summer potlucks or just a night in with the family! 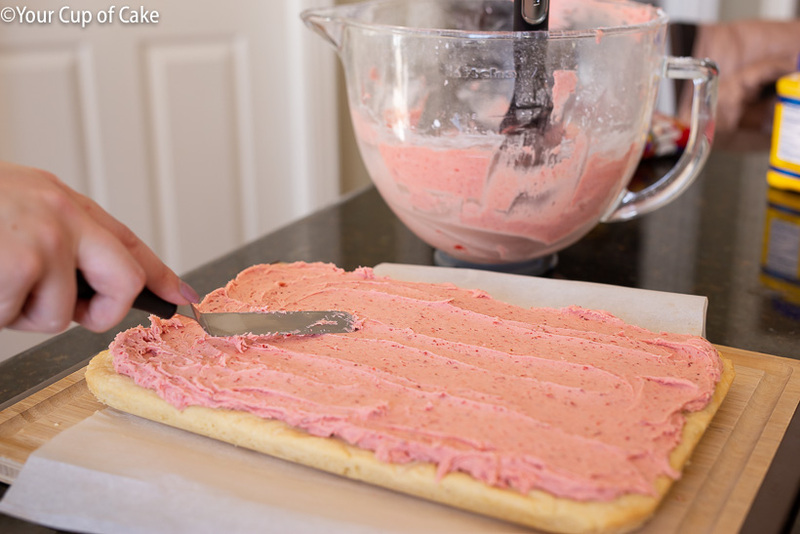 Sugar cookies are so popular anyway, why not slap on some delicious strawberry frosting and make them even better! 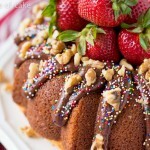 You can top with with fresh strawberries or sprinkles to really dress them up for a party. 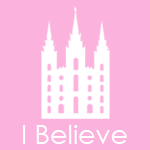 Do you know what’s magical? A recipe that slices perfectly! This is one of those recipes! There’s just something so satisfying when your slices all look perfect! I have an entire post on making the best strawberry frosting because time after time I top cupcakes, cookies, cakes with this frosting and people just can’t get enough! I even made it to top the cupcakes at my own wedding and people were coming up to me asking for the recipe (not congratulating me on getting married haha). 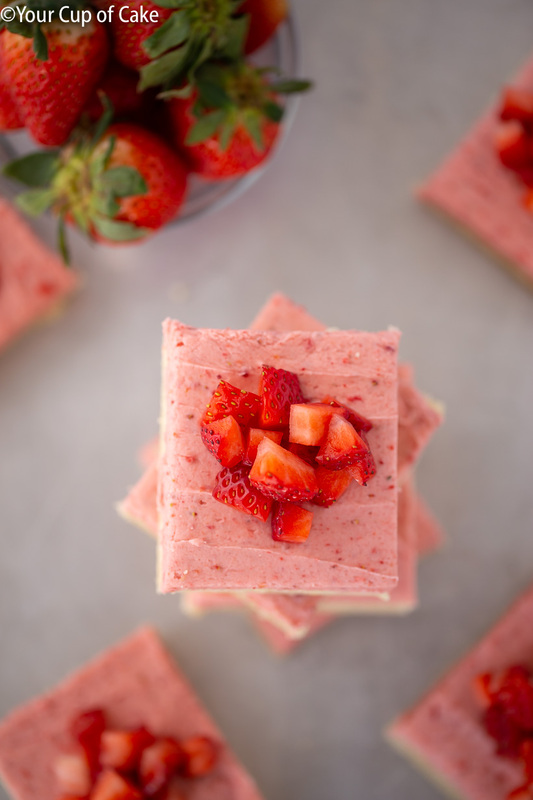 This secret ingredient is something I’ve been using for years and I love it because it means I get to make strawberry frosting without any red dye or artificial color! That’s right, all that color is all natural! 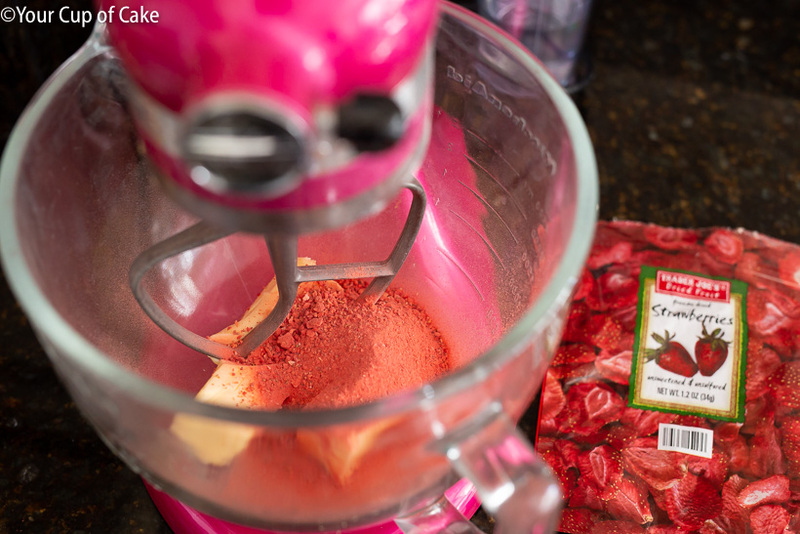 I use freeze dried strawberries to make the magic happen. I get mine from Trader Joe’s but they are becoming popular so other grocery stories carry their own brands. 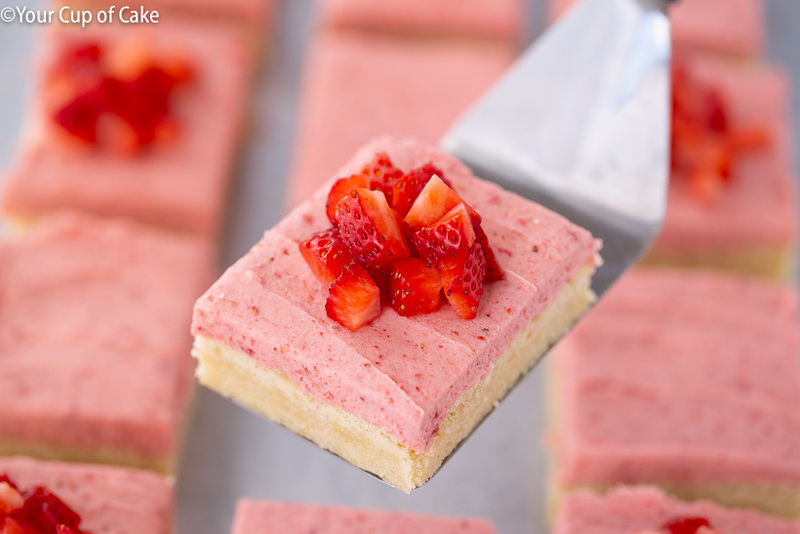 If you want a strawberry frosting people will go wild for, this is it! 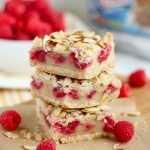 Sugar cookie bars are great because after you make the dough you can just dump it all into your pan, press flat, and bake! So fussing with dough balls or multiple batches going in and out of the oven! Spread on that incredible strawberry frosting! Making dessert for a party can be intimidating! First of all, you have to pick a recipe that feeds at least 15 people, you don’t want to slave away all day in the kitchen, you still want people to be somewhat impressed with your baking abilities, and then you have to transport the dessert to the party! 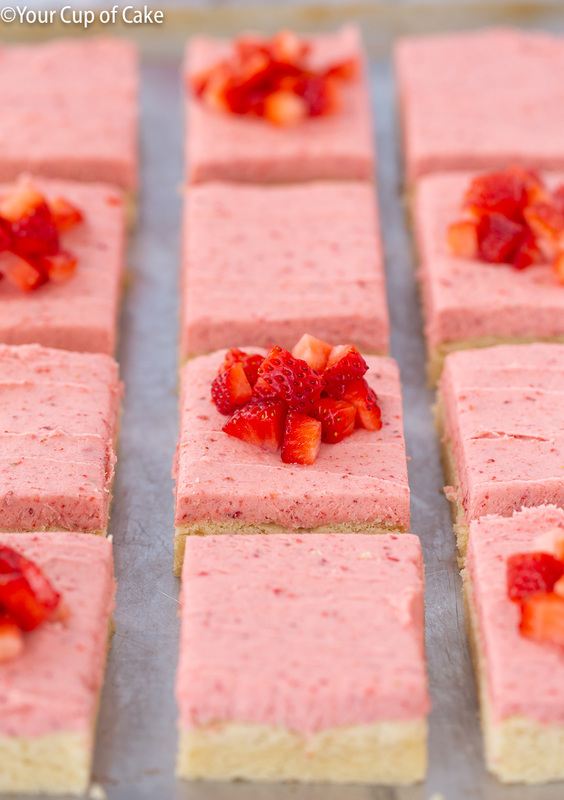 These Strawberry Sugar Cookie Bars solve all your problems. 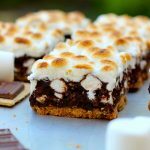 The recipe is baked in a casserole dish, so you can make 12 BIG pieces or make 24 perfectly sized slices! This recipe has very little fuss and doesn’t take much time to prep. 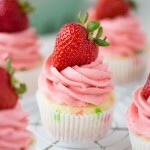 The strawberry frosting alone will have everyone cheering your name by the end of the party! 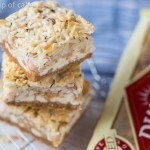 And bar desserts are super easy to transport, just cut them in the casserole dish, cover with foil and drive! 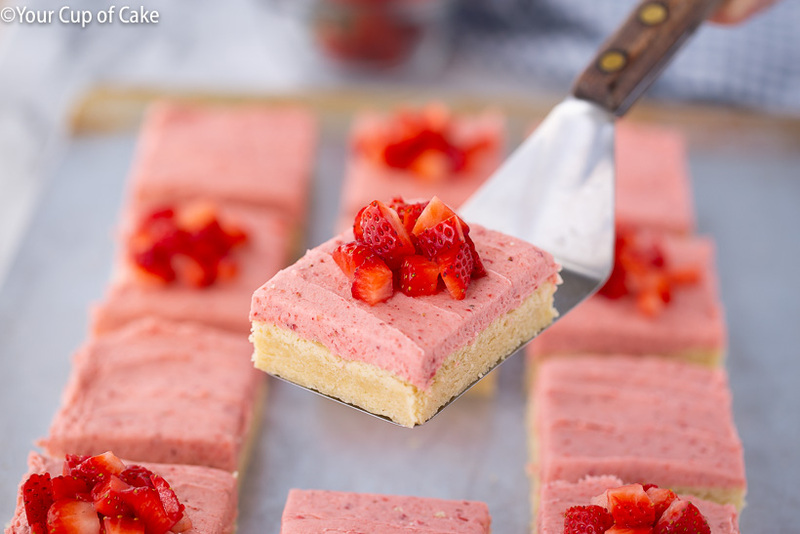 Sugar Cookie Bars topped with the best Strawberry Frosting ever! 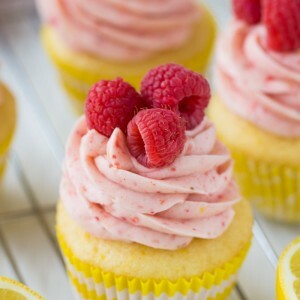 FROSTING: Beat butter, vanilla, lemon juice (optional), crushed freeze dried strawberries and 1 cup powdered sugar. 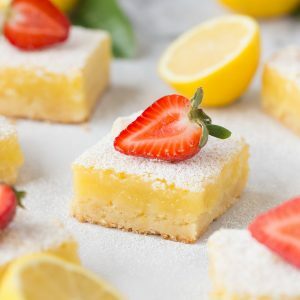 Continue to add powdered sugar until you like the sweetness level, the frosting should still be soft enough to easily spread on your bars with a knife. If it gets too thick, add milk or more lemon juice. 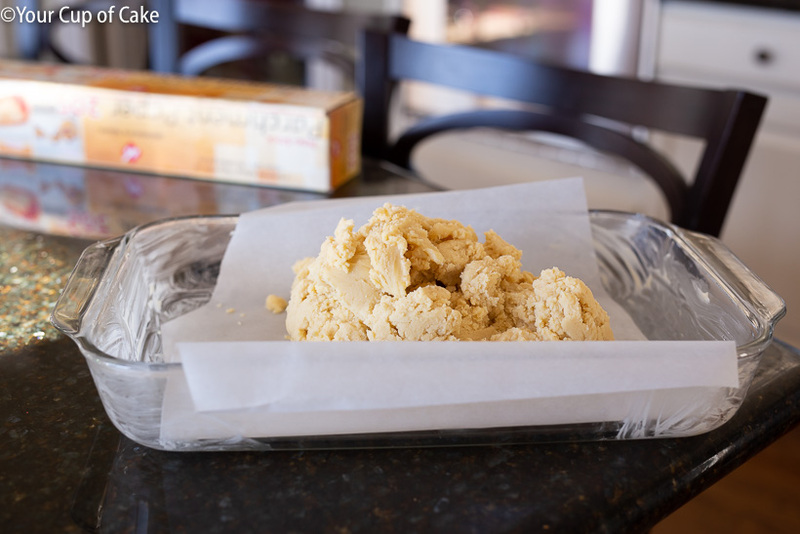 Once your bars have cooled, lift up on the parchment paper to remove the entire thing from the pan. Frost and top with fresh strawberries. If you want to add sprinkles add them immediately after frosting to make sure they stick! Enjoy! The perfect recipe for a Spring potluck! 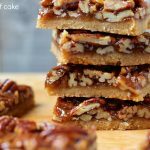 As I started making these bars, I discothat I didn’t have any almond extract. 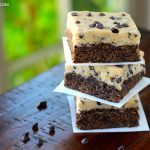 I substituted coconut extract and it was a great substitute! It balanced perfectly with the strawberries and lemon juice.